In case of stall torque motorized cable reeling drum the stall torque motor remains energized in both winding and unwinding operation of cable. In case you want to save power during long stoppages of machine, then a contactor and timer circuit can be installed in your panel. However, this is only an optional feature and is not a mandatory requirement. 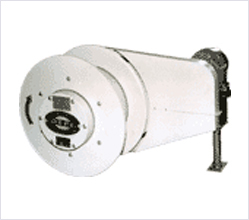 Since the stall torque motors are continuously on during both winding and unwinding direction.